Here's what you need to know about tumbling shares in Insys, Clovis, and Aegerion. Biotech stocks headed mostly higher in May as investors cautiously returned to the industry following a stunningly big run in 2013 and similarly striking drop earlier this year. However, not every biotech stock moved higher last month. Investors' patience for stocks in the industry remains thin, and share prices in former highfliers Insys Therapeutics (NASDAQ:INSY), Clovis Oncology (NASDAQ:CLVS), and Aegerion Pharmaceuticals (NASDAQ:AEGR) crumbled during the month. Given biotech's hit-and-miss nature, let's look at the catalysts that sent these shares tumbling and see whether the stocks may bounce back. Insys' best-selling drug is Subsys, an opioid treatment that received FDA approval in 2012 for breakthrough cancer pain. Subsys competes against Teva Pharmaceutical's Actiq and Fentora, two drugs that have had a checkered past that includes a $400 million dollar settlement with regulators over marketing practices tied to off-label use. Nonetheless, Actiq and Fentora remain the go-to treatments for such pain; however, Subsys' sales have climbed more than 300% in the past year, reaching $40 million in the first quarter. That growth, however, has caught the attention of the same regulators who previously investigated Teva, creating worries that Insys may end up on the hook for a similar settlement. Insys claims it's in the clear, but investors are right to worry. Subsys is Insys' only drug, and with only $47 million in cash on the books there isn't a lot of cushion on its balance sheet if a settlement is necessary. That said, Subsys sales aren't likely to crumble. Cancer pain remains a significant unmet need, and opioids like Subsys remain valid treatment options. If Insys weathers the regulatory storm it could see Subsys sales climb into the hundreds of millions annually as it eats away at Actiq's remaining market share, which still totals more than 35%. Insys is also hoping for an FDA decision this year on its reformulated marijuana-derived version of the anti-nausea drug Marinol. Insys thinks that its new formulation could capture significant share of Marinol's sales, which at the drug's height totaled more than $100 million per year. Clovis was one of 2013's darlings, jumping more than 200% on optimism that the company would find a suitor. Instead of getting acquired, Clovis paid more than $400 million to buy Ethical Oncology Science and get its hands on that company's promising breast cancer drug, lucitanib. Lucitanib is in midstage trials for patients with FGF aberrant genes,which are found in roughly a quarter of all breast cancer cases. If lucitanib succeeds in trials, Clovis could eventually capture $470 million in milestone payments from Servier, its partner on the drug. Clovis is also developing ovarian cancer treatment rucaparib, a PARP-inhibiting drug that put up solid results in phase 1/2 studies. In those studies, more than 80% of patients responded to the therapy, prompting Clovis to begin a phase 3 trial of the drug. Clovis' share price drop is tied to another drug the company is working on for non-small cell lung cancer: CO-1686. That drug notched FDA breakthrough designation in May; however, Clovis presented data that failed to impress attendees at the just-ended American Society of Clinical Oncology conference. That data showed that some patients in the trial developed hyperglycemia, a condition that can cause cardiovascular troubles. Before investors run for the hills they should recognize that while the safety profile is concerning, there are currently no approved treatments for the specific lung cancer population that CO-1686 targets, suggesting that the hyperglycemia news alone may not derail the drug. There could be substantial opportunity; but that's only if Clovis succeeds in trials, which will be no easy feat. Cancer drugs are among the toughest to advance through trials, with a failure rate over 50% even in phase 3. Aegerion's shares fell more than 50% in the first quarter and another 30% in the past four weeks, on fears over marketing practices. Aegerion won approval for Juxtapid, a treatment for homozygous familial hypercholesterolemia, or HoFH, in December 2012. HoFH is an ultra-rare disease with a patient population measured in the hundreds in both Europe and the United States. Juxtapid, along with rival pharmaceutical Kynamro from Sanofi and Isis Pharmaceuticals, are high-priced orphan drugs. Juxtapid carries a price tag of roughly $235,000 per year, making it one of the planet's most expensive treatments, and Kynamro is moderately cheaper at $176,000 per year. Thanks to those high prices, Aegerion's Juxtapid sales have been growing quickly, jumping from $6.5 million in the second quarter of last year, to $16.3 million in the third quarter, and $24 million in the fourth quarter, resulting in full-year sales of $48.5 million. Aegerion's first-quarter Juxtapid sales of $27 million, though, fell short of analyst hopes. As a result, Aegerion cut its 2014 full year forecast for net product sales to between $180 million and $200 million from the prior estimate of between $190 million and $210 million. The combination of lowered expectations and unanswered regulatory scrutiny make this one very speculative. Even after falling as far as shares have, the company's market cap is still nearly five times its projected sales this year, which hardly makes it cheap. 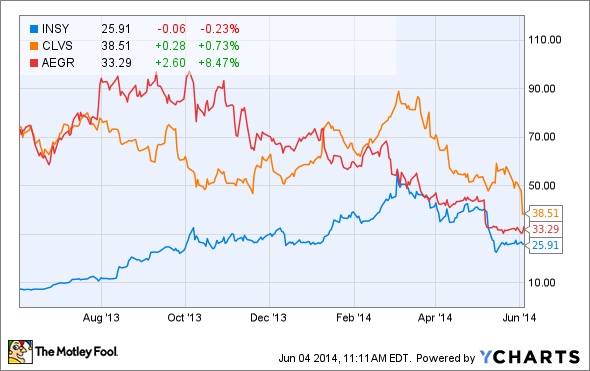 All three of these companies face challenges that Investors will want to keep an eye on. At Insys, investors should see whether the regulatory investigation prompts doctors to shift scripts away from Subsys back to Actiq or Fentora. Clovis investors will need to keep a close eye out for updates on the progression of its clinical trials to gauge whether the company can eventually succeed in launching its first product. And Aegerion may be even more speculative as it deals with regulators and increased competition.